A ‘Wet Hot American Summer’ Sequel Might Happen!!! 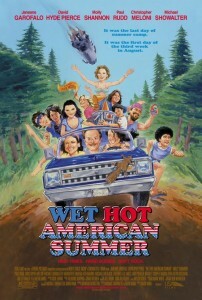 Director David Wain recently sat down with Jeff Goldsmith for a Q & A session and they talked about the upcoming tenth anniversary of that cult comedy instant classic ‘ Wet Hot American Summer’. When discussing the anniversary, Wain said that Universal won’t release a 10th Anniversary edition of the film. Universal is stupid to not do this. This movie has such an all-star cast which were all almost unknowns at the time. They included: aul Rudd, Amy Poehler, Bradley Cooperand Elizabeth Banks as well as Janeane Garofalo, David Hyde Pierce, Michael Ian Black, A.D. Miles, Ken Marino, Joe Lo Truglio, Molly Shannon, Christopher Meloni, Zak Orth, Margurerite Moreau, Judah Friedlander and Michael Showalter who co-wrote the script along with director David Wain (”Role Models,” “Children’s Hospital”). Wain: Yes, we have been talking about a sequel, prequel, something or other. Goldsmith: The idea I’ve heard tossed around is that it would be a prequel but when you shoot it they would be 20 years older. Wain: Well, no that would be absurd. The prequel would be the same summer so they would be 20 years old for the part yeah, but not younger. So it would be 40 year olds playing 16 year olds. And yeah, we’re in the early stages of thinking about that. Goldsmith: I hope it happens. Oh man, that would be too good. I wonder if he cold get all the same people back for this film considering they are huge stars now. I’m willing to bet he can. I hope this happens. This entry was posted on Tuesday, June 21st, 2011 at 12:58 pm	and is filed under Film, News. You can follow any responses to this entry through the RSS 2.0 feed. You can skip to the end and leave a response. Pinging is currently not allowed. « Warren Beatty Returns To The Big Screen After A Thirteen Year Hiatus!! !